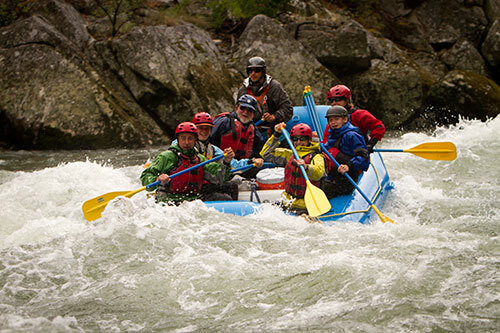 Experience Idaho Rafting with Far and Away Adventures. Join us for an American Safari, on 3 of Idaho’s most scenic rivers. Join Far and Away, Rafting the Middle Fork of the Salmon river is the most prized wilderness river trip in North America, if not world. Far and Away adds a unique, multi-dimensional luxury component to the Middle Fork experience, making it a trip-of-a-lifetime, a truly memorable and comfortable experience for your family and friends. The Middle Fork was one of the original eight national wild and scenic rivers protected by Congress in 1968 because it’s in a league all of its own. It flows 100 miles through dozens of thrilling rapids, deep turquoise pools full of native cutthroat trout and towering granite cliffs in the Impassible Canyon. On the banks of the Middle Fork, spacious wooded and beach-front campsites are oh-so-relaxing as a gentle breeze hums a tune through stately pines that can be heard only in the wilderness quietude. It’s a good thing that Far & Away Adventures offers trips on the Bruneau River, or certainly, you’d never hear about it. It’s one of the best-kept secrets of all the great multi-day wilderness river trips in America, and definitely one of the most spectacular. The Bruneau River became a national wild and scenic river in 2009 as part of an Owyhee Canyonlands wilderness bill, which also protected the Bruneau Canyon from rim to rim. After experiencing the Bruneau, we’re sure you’ll agree that the canyon is deserving of full protection. In fact, if it were located in a place like Kansas, it’d probably be a national park.